Super Mario All-Stars is a collection of the four main NES/Famicom Super Mario Bros. titles, upgraded to take advantage of the SNES' improved hardware. Unlike most SNES games, all of the graphics data is uncompressed. There's a lot of unused stuff here, some of which suggests that All-Stars may have originally been developed as a more straightforward port of the games. 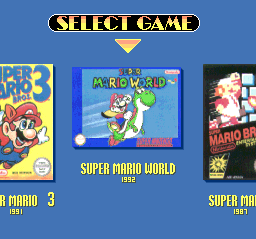 In 2010, a completely-unchanged ROM image was packaged with an officially-coded Virtual Console emulator and slapped on a Wii disc for the 25th Anniversary of Super Mario Bros. Content not specific to any particular game. This alternate version of the Nintendo logo can be found among the sprite graphics for Super Mario Bros. Unlike the final version, the racetrack surrounding the text is less round, and the logo isn't paired with a giant Mario coin. 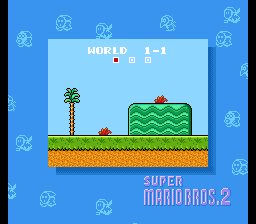 The majority of the game's sound effects were imported directly from Super Mario World. This includes a number of sounds that ultimately went unused, such as Yoshi's sounds. It's likely that these are just leftovers, and were not actually meant to be used in Super Mario All-Stars. To activate debugging features for all four games, either use the code 008C1E01 or set SRAM address 700007 to 01 in a debugger. Some image banks in the ROM have placeholder text that marks where graphics will be loaded in-game. The black text box is プレイヤー, translated as "Player", marking where the Player graphics are stored in VRAM. The three orange tiles are パワ床 (POW Block), スイショウ (Crystal), and フラスコ (Flask). Taken from the Battle Mode tile bank. Again, the black box is プレイヤー (Player), marking where Mario and Luigi's graphics are stored. From the Super Mario Bros. 3 tileset, this text translates as "Mario, Luigi" and denotes the location of the player graphics. This text block appears in both Super Mario Bros. and Super Mario Bros. 2. ＢＧカキカエ　エリア　translates as "BG Transfer Area", and is used to indicate the location of animated background tiles in VRAM. Hopefully this doesn't need translating. 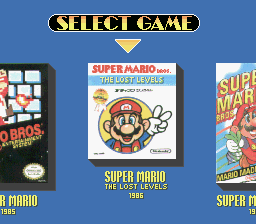 "PLAYER" marks the slot for player graphics in the Super Mario Bros. and Lost Levels ending sequence. Found in all versions of Super Mario All-Stars, this text is located with the rest of the pause menu graphics. またもうやめ translates as "Take a Break". What this would actually do is unknown. As a means of copy protection, all versions of Super Mario All-Stars perform a check to see how much SRAM is present: the game writes a value to $702000, then compares it with the value at $700000. If the values match (due to address mirroring), it means 8 KB of SRAM is present and the cart is likely genuine, but if the values are different, it means more than 8 KB of SRAM is present and the game is likely running on a copier. If the latter scenario occurs, the game stops and throws up a warning message. The message text differs between versions, but the location of the routine is the same; to trigger it, use Pro Action Replay code 1180508F and choose Super Mario Bros. 2/Super Mario USA from the game menu. The game that started this whole mess. Yes, even this port has unused graphics. Ending text graphics which appear after the Princess Toadstool sprites. This is supposed to be for...well, The End. Given the different sizes, it was probably supposed to be animated. A "PAUSE" graphic which might have been used before the save menu was implemented. This page appears to have been used as a "scratch pad" for testing multiple variations of some common Mario poses. None of these graphics are used by the game itself. The red and blue sections of the palette are swapped compared to the final version. These graphics were used in Nintendo Power video previews and can be seen in screenshots on the back of the North American Box. An early Mushroom Retainer, found in the main enemy graphics bank. This was likely used before the unique "castle clear" cutscenes were implemented. Only the top half of the second frame was cleaned up and reused in the final game. An early Princess Toadstool. She's quite short here, much like her original Super Mario Bros. counterpart. 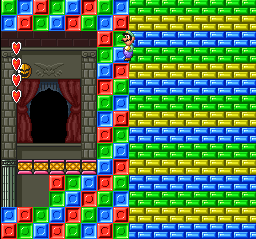 16-bit renditions of the original 8-bit Super Mario Bros. tiles, and a unique ground tile not found in the original game. An unused piece for the underground background. An alternate sea coral. What's more interesting is that it's animated, unlike the coral block used in the final! Judging by its' darker coloring and lack of black outlines, it's likely these were meant as background decoration, and not actually of the level. WE PRESENT YOU A NEW QUEST. The ending text of the original NES version is present, but not used. 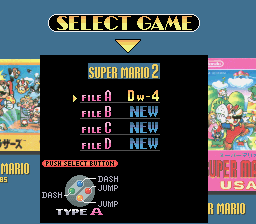 It had already been altered to take into account some changes in All-Stars: "BUTTON B" was changed to "BUTTON Y" in accordance with the All-Stars control scheme, and "SELECT A WORLD" was changed to "START A URA-WORLD" since you can no longer select the world from the title screen. Also known as Super Mario Bros. 2. 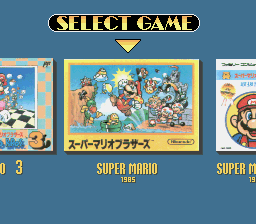 Super Mario All-Stars was the first time players outside Japan got to play this entry. A mockup of what the logo would look like with the above tiles. This text is loaded on layer 1 of the preview screen shown before a level starts, but is never visible. This was used in the original FDS version when you successfully beat the first eight worlds without using warps, thus unlocking the secret World 9. This doesn't happen in All-Stars, where you're simply taken straight to 9-1. The text contains the apostrophe and quotation marks, but these characters aren't present in the font used in All-Stars, so they appear as garbage. This was used when dying in World 9 in the FDS version but, again, doesn't appear in All-Stars. For reasons unknown, besides the apostrophe, the N character in the word "AGAIN" appears broken as well. The original ending text of the FDS version. As with the FDS game's message, the last two lines' palette settings are different than the rest, though in this case it's a pinkish color not used by anything else in the game. It should be noted that the All-Stars version does not have the 100,000-point bonus for each extra life remaining, likely because the game's save function includes your current life count (capped at 128, which can easily be accumulated at the structure just into World 1-1) and goes level-by-level, which would make it rather easy to get an absurdly-high score. Also known as Super Mario USA and "Doki Doki Panic Romhack". These slot graphics are based on the NES version, but the 7 is brand new! These were discarded for the larger slot icons. A tomato that should've appeared in Wart's boss chamber, as it does in the NES version. Instead, it's replaced by the cabbage-looking thing from World 2. An unused fire sprite very similar to the original NES version. The final game has an animated spinning fireball instead. Graphics ported directly from the NES version, unmodified. The mountain/cavern tiles from the NES version, revamped for All-Stars, but left unused in favor of new and better terrain design. This was the block that composed the icy terrain in ice levels in the NES version. It suffered the same treatment as the cavern tiles above. The dark lines in this tile match the wood tiles from the "inside tree" sections of World 5 in the original game, which means this could be a revamp of said tiles, though it doesn't look anything like wood. This could be an early version of the bricks pattern seen in tower sections, based more closely on the original design from the NES version. A static, non-animated, whale tail. Via the Debug Mode, it's possible to see a wall of otherwise-unused colored bricks placed to the right of Wart's chamber. These are styled after the bricks used in the NES version, and were replaced with a completely different design in the remake...though evidently not completely replaced. A fanfare not present in the NES version. Possibly an alternate win cue for the slot machine? This fanfare would later be used in Super Mario Advance 4: Super Mario Bros. 3 for when you win the picture slots minigame. Carried over from the NES version, just without the need for a second controller. In all versions, pause the game then hold L + R and press Select to cause the player to lose a life. Since this was essentially a direct port of the NES game, this has the most unused content! 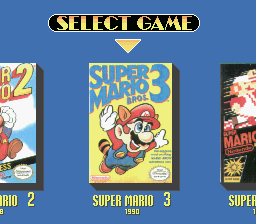 For more information, see the Super Mario Bros. 3 article. They're still in the game! Some new, some updated, some unchanged. While a new debug mode was put into the game, the old NES debug mode can still be accessed with the code 7E016080...although this unfortunately doesn't seem to activate the level select. Press Select to cycle through Mario's forms, or Select + A/B/X/Y to toggle Goomba's Shoe. Due to a programming oversight, the old debug mode has a tendency to randomly enable itself on real SNES consoles. See the Notes page for the technical details. Just like in the original game, the Spade game has an unused counter variable which controls how many times you get to play. Setting the value at address 0x7E1019 to any value besides 00 during the game will allow you to keep trying until either you win, or the counter reaches zero (whichever comes first). Simply press A, B, or Start to spin the reels again. Like in the original Super Mario Bros. 3, two enemies remain unused in the remake. A gold version of the Cheep-Cheep enemy. These only appear in the seventh unused level, and always come in groups of three. They swim faster than normal Cheep-Cheeps, in a wave-like motion. A faster green version of the Para-Beetle enemy. These enemies only appear in the ninth and tenth unused levels, and can only be generated by the also-unused Green Para-Beetle spawner. 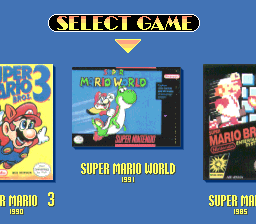 Present near the Super Mario Bros. 3 graphics. Probably development text that was left in the ROM. European version info. And other stuff. 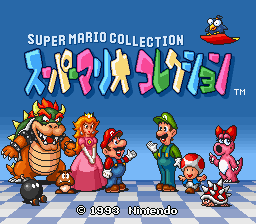 In Japan, Super Mario All-Stars is called Super Mario Collection, and the title screens reflect the regional releases. In Collection, the logo characters offer a broad flashing palette, whereas in the international versions the title logo is rather bland, still flashing albeit less frequently. Pressing Start before the lights turn on causes the game to go to the menu straight away, rather than the lights turning on first (as is the case in the international versions). 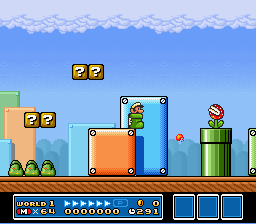 A glitch can be performed in the international versions where the title music still plays by timing the Start button just right before the light switch transition. The "in the dark" chatter is also different between the Japanese and international versions. This was changed because the line, "One more beer please" can be heard in the background in the Japanese version, and Nintendo of America did not allow mention of alcoholic drinks at the time. 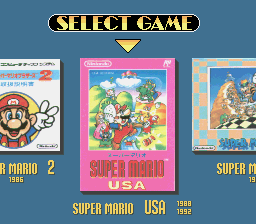 The Japanese version uses the original box art for each game on the main menu, whereas the international versions use the US box art. 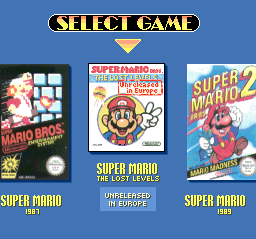 For whatever reason, Nintendo opted not to rescan the boxes for the European version, and instead edited the US versions to add a few Europe-specific details, such as the round Nintendo seals and the changed dates. The international versions also received a few other minor touchups, including larger shadows, a white arrow border, and brighter colors. 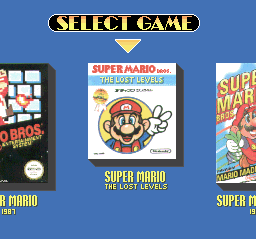 For the Japanese Super Mario Bros. 2, which was unreleased elsewhere, Nintendo simply took the Famicom Disk System box and edited it to say Super Mario Bros.: The Lost Levels (with part of the original black text being moved down below the logo) while removing Diskun, the FDS mascot. The European version doesn't list a year. 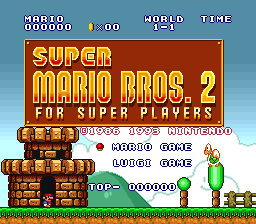 The Japanese Super Mario Bros. 2 is referred to as Super Mario Bros. 2: For Super Players on its title screen, a subtitle that would later be used for the Super Mario Bros. 2 mode of Super Mario Bros. Deluxe. The international versions also added a trademark icon. 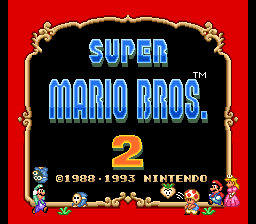 The US/European Super Mario Bros. 2 is referred to as Super Mario USA in the Japanese version, with both the original 1988 and later 1992 release dates; its title screen uses both of these and the 1993 release date which was appended to all four games. 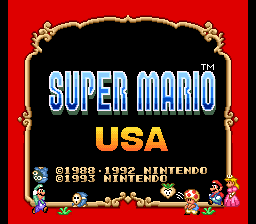 Also, the logo for Super Mario USA uses a brighter shade of blue that the Super Mario Bros. 2 one. 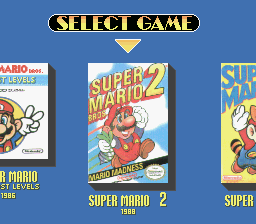 The level cards were also changed, although interestingly the international logo looks far more like the Japanese Super Mario Bros. 2 logo. 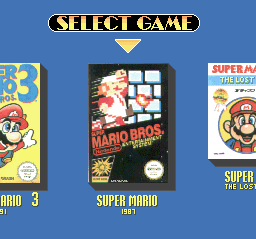 The Super Mario Bros. 3 date was also changed (1988 for Japan, 1990 for America). The "FILE" text in the file select menus is pink in the Japanese version, and red everywhere else. The controller button colors in the US version were changed to purple and lavender, and the Y and X buttons were made concave. 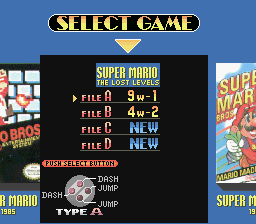 The European version retains the original button colors, but removes the glossy look for some reason. 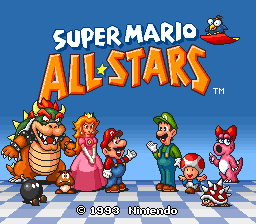 In December 1994 (1995 for Europe), Super Mario All-Stars was reissued as Super Mario All-Stars + Super Mario World, and was released solely as a pack-in title in the US. 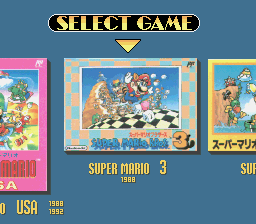 As this edition was not released in Japan, Super Mario World is based on its American release featuring slight changes. 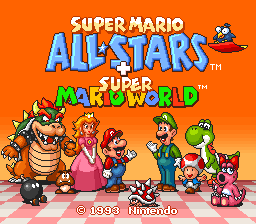 Aside from the addition of "+ Super Mario World", the title screen's background was changed to orange, "All-Stars" to blue, the floor to pink, and the copyright info to light red with a dark red outline. Birdo was moved to a sitting position in the front, pushing the Spiny towards the center, and Yoshi was put in Birdo's former place. Bowser's snout was shifted slightly to the right, and the shading on Peach's crown was fixed. 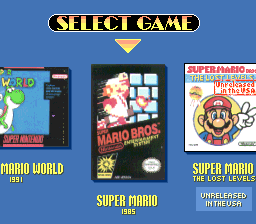 The menu was of course updated to add the Super Mario World box and info. 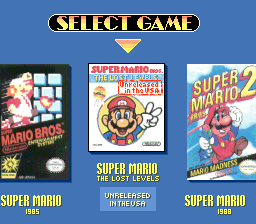 As a result, the other four games were positioned closer together, and the shadows underneath the boxes were reverted to their smaller Super Mario Collection versions. 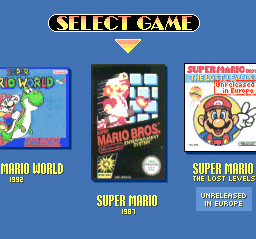 Interestingly, the Super Mario World box used in the European version does not match any known PAL release of the game (three variations of which can be seen here, here, and here), but appears to have been created from scratch. The NES boxes were rescanned and resized. Once again, Nintendo scanned only one set of these boxes for the US and European versions, but this time they opted to use the European "NES Version" boxes as the source, editing them in the US version to replace the European-style round seal with a US-style oval one (but neglecting to remove the telltale extra "NES Version" text). 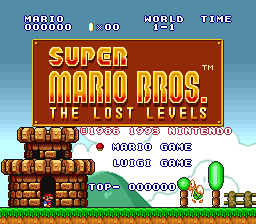 Oddly, the Lost Levels box replaced the black text below the logo with a much larger "stamp" graphic, which clarified that it had not been released in America (Europe in the European version). The "1986" graphic was also removed. 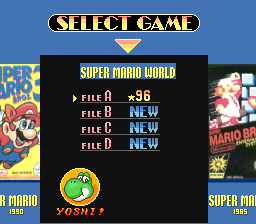 When selecting Super Mario World, the controller settings at the lower-left corner is replaced by a picture of Yoshi with "YOSHI!" below it, as World uses its own distinct control system. Pressing Select to change controls plays the same error sound heard when trying to change worlds in a new file. Selecting a file causes Yoshi to wink, while deleting one causes him to lick his lips. Also, the "FILE" text was reverted to pink. Pausing and exiting the in-game menu takes one second longer, for some reason. 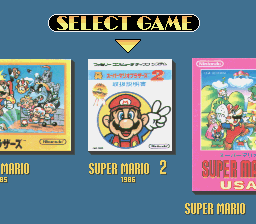 Super Mario World itself was altered a bit, most notably to give Luigi a set of unique sprites based on his distinct Super Mario Bros. 2 appearance (although certain sprites, such as ducking on Yoshi or running sideways using a triangle ramp, weren't altered). In addition, a fourth save file was added, the unique "96 exits" completion marking was removed, and the player can return to the All-Stars menu by pressing Select on the map screen and selecting the option. 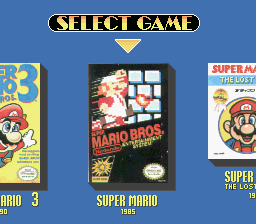 Unlike the other All-Stars games, there is no uniform pause menu and 1-Player/2-Player modes are not "locked" into the save files. This page was last modified on 13 April 2019, at 11:55.